Our shop is currently under maintenance. 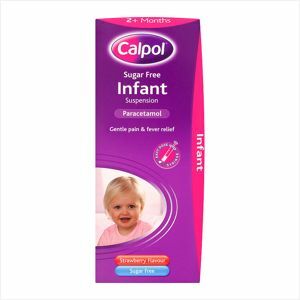 Calpol Sugar Free Infant Suspension Sachets are for oral use and will relieve pain and feverishness. It is suitable for children one to six years. For oral use only. Shake the bottle for at least 10 seconds before use. Always use the spoon supplied with the pack. Never give more medicine than is shown in the table. Do not exceed the stated dose. Do not give to babies less than 2 months of age. Do not give more than 2 doses. Leave at least 4 hours between doses. If further doses are needed, talk to your doctor or pharmacist. Do not give more than 4 doses in any 24 hour period. This product is intended for use in children aged 2 months to 6 years. Do not give this medicine with any other paracetamol-containing products. Immediate medical advice should be sought in the event of an overdose, even if the child seems well. If symptoms persist consult your doctor. As with all medicines, if your child is currently taking any other medicine consult your doctor or pharmacist before using this product. Keep out of the reach and sight of children. Check that the cap on the bottle is securely engaged at all times. We currently only deliver to the UK. All our orders are sent out using Royal Mail delivery service and we aim to dispatch all orders within 24 hours of them being received. If we are unable to meet this high standard for whatever reason we will always contact you to advise you of the delay. Standard Delivery is FREE for all orders over £40. Delivery is FREE for all NHS prescriptions to an address of your choice. The cut-off for same day dispatch of orders is 4pm. Orders processed after this time will be dispatched the following working day. Orders are dispatched Monday - Saturday. Orders will not be processed on Sundays or bank holidays. All deliveries are made using the Royal Mail delivery service in discreet, unbranded packaging. Deliveries containing pharmacy-only or prescription medicines may require a signature on receipt. Delivery is free for all NHS prescriptions.